As a former customer service manager Carol Hall was well placed to judge the response of the UKDN Waterflow (LG) Ltd team to the blockage in her drain. She was impressed with the professionalism of drainage repair engineers Mark Elliot and Dan Page, from the company’s Birmingham depot. Carol also very much appreciated their sensitive approach. She had just lost her mother, and had been very upset. She said: “I was not feeling in a very good way at all at the time, and having to then sort out a drainage problem in our home was the last thing I needed. “The UKDN Waterflow (LG) engineers didn’t know this, but the supportive way they managed the work from start to finish was very helpful to me. Carol, a pastoral care manager at a primary school, noticed that it was becoming difficult to flush the toilet in the upstairs bathroom in her detached home in Sutton Coldfield, Birmingham, West Midlands. She tried some DIY techniques to unblock it, but it only got worse. By the end of the week, Friday, she realised she needed professional help, so she called her insurer, who alerted their emergency drain blockage contractor, Lanes Group, which sent a drainage engineer to her that day. He water jetted the drain outside her home, and found that it had collapsed. He informed Carol that she needed to contact her insurer and arrange for a repair. 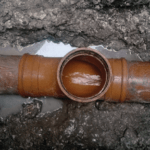 When Carol informed her insurer that it was a matter of urgency to clear the blockage, UKDN Waterflow (UK) Ltd, its repair contractor liaised with Carol and arranged for Dan and Mark to carry out the repair on Saturday, the following day. They dug up the problem pipe in the back garden and removed the collapsed section. A new length of pipe was installed, and the ground reinstated. Carol’s upstairs shower and toilet were working perfectly once more.